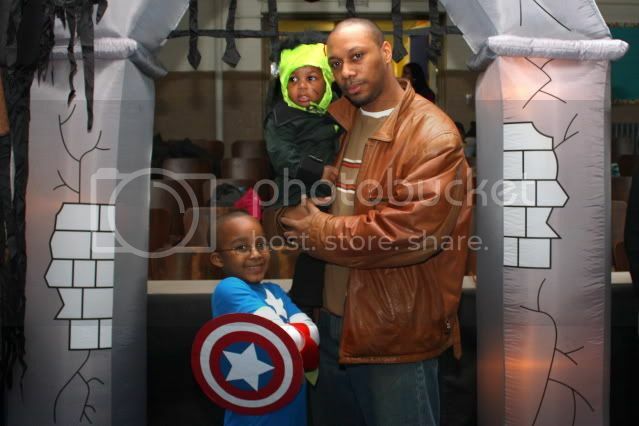 Can I just tell you...now that I have children, Halloween is becoming one of my favorite holidays again. Donovan becomes filled with this infectious excitement when I dress up with them...I just love it because I know these are the moments that his happy childhood memories will be made up of! We went to the October Fest at his school last night...I tell you, I have even more respect for elementary school teachers. Lord knows I could not deal with a bunch of screaming kids on a day to day basis...the 2 I have have me on the borderline of insanity some days! The night was even more special because Troy (AKA himself) took some time out of his busy schedule to join us. Xander (AKA Frankenstein) won the costume contest for his age group. 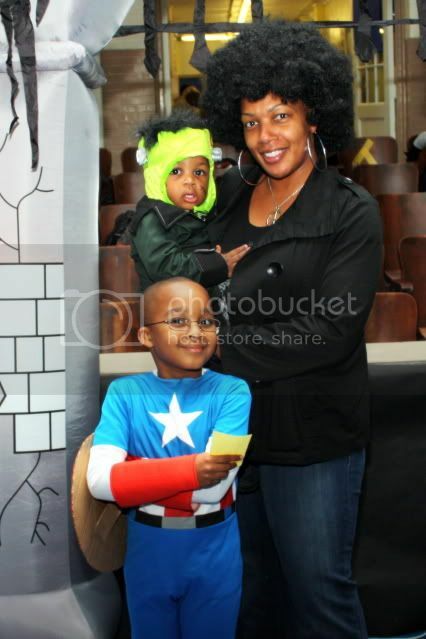 Everyone adored his costume...funny thing is, it was Donovan's 2nd Halloween costume and he looked equally adorable in it! Donovan (AKA Captain America) refused to wear the mask last night, but kept a tight hold onto the shield that I made for him! As promised on the video, here's what the finished project looks like. 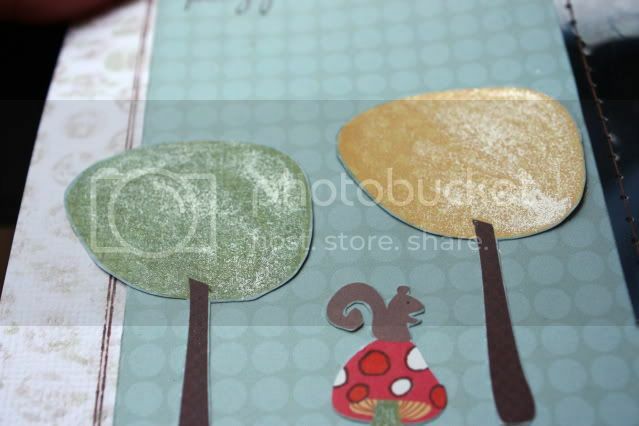 The shimmery stamped background lends interest and dimension to an otherwise plain piece of cardstock. 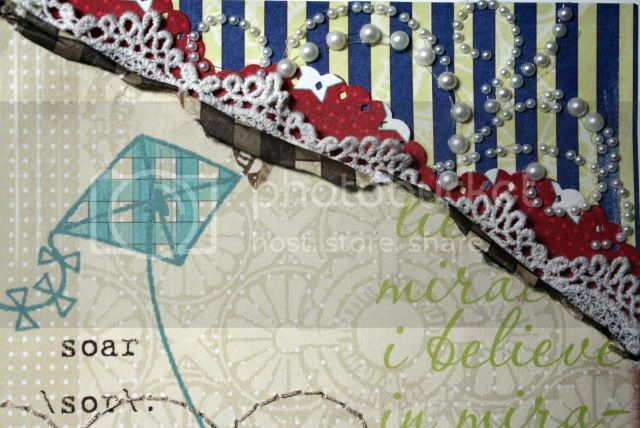 The papers used are from My Little Shoebox Little Lady Line. As you can see here, Little Lady is perfect for Little Gentlemen, too! here's a close up of the bubble wrap impression--although shimmerz dries really quickly, you'll want to use a heat gun to dry the spritz after stamping the bubble wrap so you'll keep the nice uniform circles (well unless you're trying to achieve a different effect). I also added some shimmerz paints to my project. Sunflower shimmerz makes this sun a little brighter! I used mossy stone and sunflower shimmerz on the tree tops for a wonderful iridescent sheen. 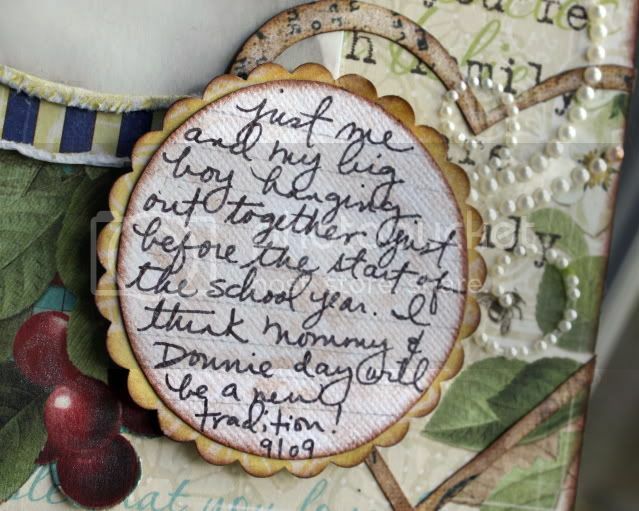 I created a few more projects that combine Shimmerz with My Little Shoebox Little Lady Line. I mixed mossy stone shimmerz with acrylic paint and splattered it on the background here. 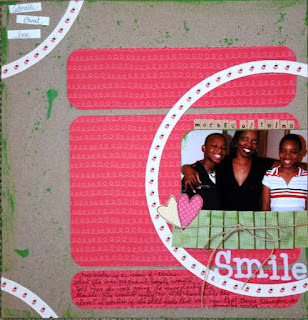 For this next layout, I used Jeni Boivert's tutorial to create the flower here. I spritzed it liberally with Baby's Breath spritz. This paper line is filled with little lady bugs. I created this lady bug by punching circles from 2 papers, cutting one in half and then layering them. I then wrote the sentiment and then cut it out...I thought "good luck" was perfect since that's what lady bugs are supposed to bring. Thanks so much for taking the time to view the video and comment on my projects! I hope you use these ideas as a springboard for you own! Have a great day! This is a quick video of my mom and I on our cruise to Bermuda (her first vacation ever!) --we're so silly! LOL! ...and boy did we eat! When you go on a cruise, be sure to check your diet at the door...err...gangway that is! Thanks for taking a peek! I'll have pictures up some time soon. My boys are growing up much too quickly don'tcha think?! 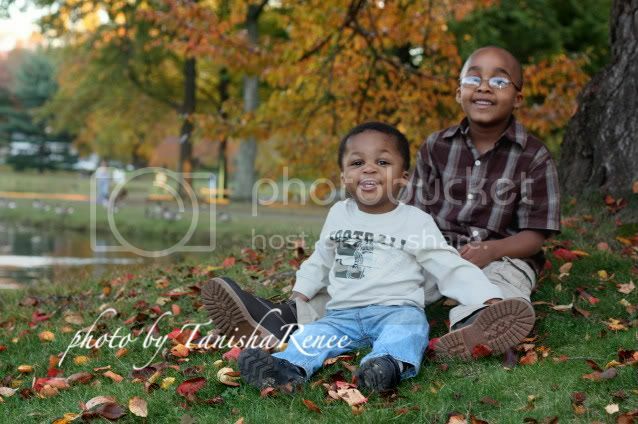 Just take a look at them--Donovan is a happy-go-lucky kindergartner . He loves school and thinks his teacher is the greatest. Notice anything different about him? You guessed it, my baby now wears glasses. He picked them out all by himself and I think he is totally adorable in them. My Xander is changing everyday. He's trying to add more and more words to his vocabulary. His most notable ones are eat, water (wah-wah), no, go, juice (dew), move, and quite a few others. He's 18 months old and I think he's ready for potty training. Whenever he has a bm he comes to me and says "mommy, boo-boo". He'll even go as far to go and grab a diaper for me. Notice anything different about him? Look closely....we cut his hair! No more mini afro! This past Wednesday Troy cut his hair while he sat on my lap--I thought I was ready, but truth be told, I almost cried...he looks like such a big boy. Hey y'all...you gotta be in it to win it! Purple Cows' HUGE giveaway that is! Up for grabs is a total of $9000 in prizes...that's practically unheard of, but it's REAL!!! Plus I'm offering some additional prizes to help get you all motivated to help me get the word out, but right now I have more prizes than people to give them to. What's up with that? So far 4 people have said "Tanisha sent me" either on Purple Cows' blog or the facebook page. There's a DT contest going on too and I need your help to achieve at least 200 in order to qualify. So please take a moment take a moment and help me out!!! PLEASE...with sugar on top!!!!!!!!!!!!!! Testing The Ice Book Giveaway...Winners Announced!! The grand prize which includes the Kidorable Hat, Glove & Scarf set (random styles) and a copy of Testing the Ice goes to April! Congratulations everyone!! I hope you enjoy reading the book as much as I did! Taking photos of Avni's henna ceremony was so much fun for me. She's the daughter of one of my former co-workers and I was honored to have been asked to capture the event. Everything was so beautifully decorated and colorful...even the ceiling was covered with a number of different color saris. Here are just a small sampling of some of the close-ups that I captured of the finished product! If you look closely at her left palm, you can see the face of a bride. The mendhi artist also drew a picture of a groom on the right palm so when Avni placed her hands palm up, the bride and groom were facing each other. I attended the wedding ceremony as well and Avni made an incredibly beautiful bride. I wish her and Chirag all the happiness their hearts can handle and more! 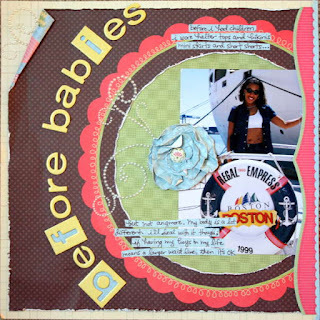 It's been a little over a week since I last blogged, but for good reason...I just returned from the Croptopia Getaways Bermuda cruise that I won from Scrapbooking and Beyond Magazine. I took my mom along with me (her first vacation ever) and we had a ball scrapping and touring Bermuda. Croptopia Getaways spoiled us so much that my mom has decided to become a scrapper with all of the goodies and lessons she's acquired! 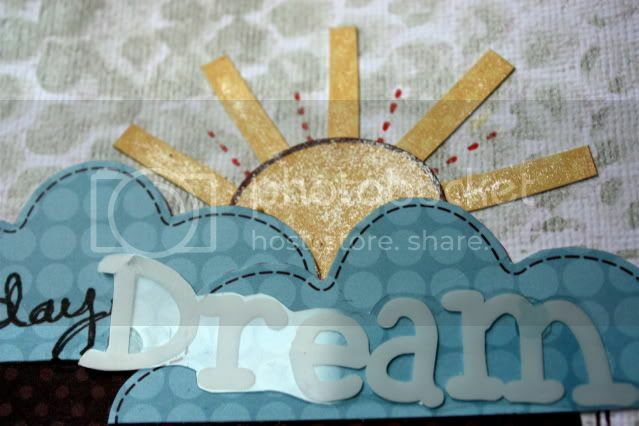 I took a couple of awesome classes and learned a lot in the mini album classes taught by Cheryl Mezzetti (always wanted to take one of her classes) and learned some Cricut tips and created a couple of awesome projects taught by Cara Miller (aka the Cricut Queen). There were quite a few make n takes, too! I can't wait to share the pictures here! If you know me, then you know I took a few hundred photos and will definitely share by way of photos posts and layouts! Bermuda is such a beautiful island and so was the ship we sailed on, Royal Caribbean Explorer of the Seas. I'll definitely tell you all about my trip over the course of the next week or so, but right now I'd like to share the layout I created for Dreamgirls latest challenge and Shimmerz! 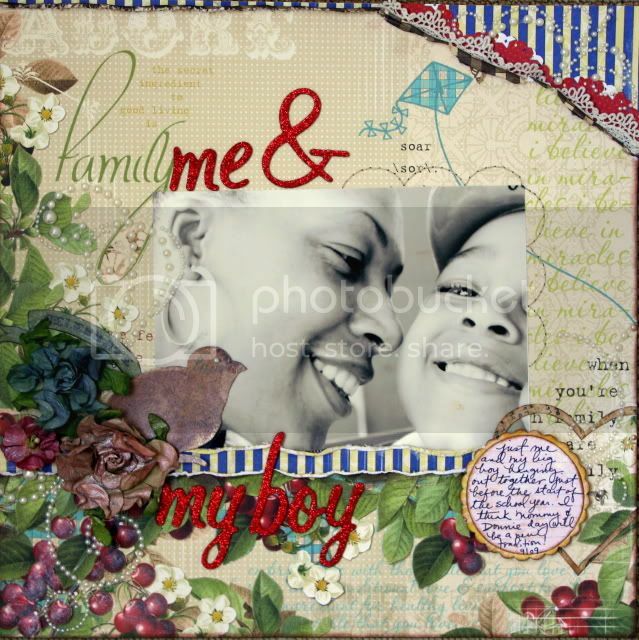 Prompt: Using the negative paper left over from a punch - get creative and incorporate it into your layout - You can stencil through it, mask it, or make an embellishment out of it . 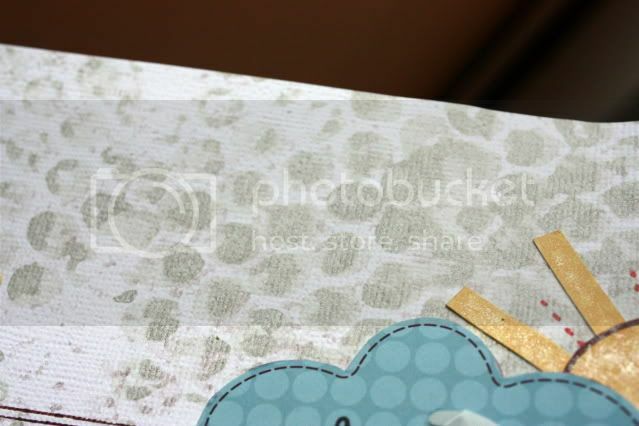 Product: Use a scallop circle journal spot. Click here to see what the rest of the Dreamgirls created! I took this photo on Mommy and Donnie day; not an official holiday, but a fun day for my li'l man and me! How gorgeous are these Webster's Pages papers? OMG...love them! 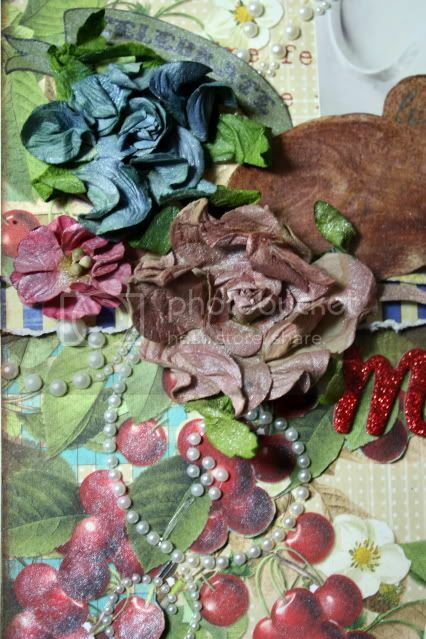 I loaded up on the shimmering spritz; I sprayed the flowers and the bird that I cut from patterned paper. I also dipped a paint brush into my spritz and used it to paint the cherries. In the early 1950s, legendary baseball hero Jackie Robinson literally "tested the ice" for his kids who so eagerly wanted to skate on the frozen lake near their home. 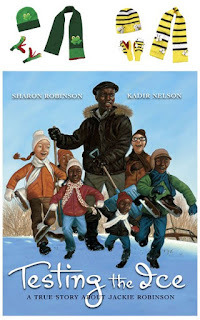 Under Sharon Robinson's skillful authorship and Kadir Nelson's vivid illustrations, TESTING THE ICE also becomes a stunning metaphor for her father's remarkable racial breakthrough. 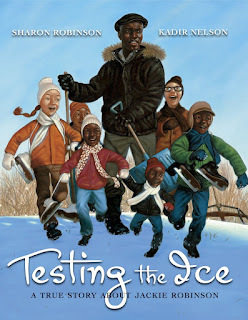 I was so excited when I was contacted by Big Honcho Media to review Scholastic's new book, Testing The Ice. We are avid readers and love books in our home, so this opportunity was very welcomed! I'll admit when I first opened the package, I did the one thing they say you're not supposed to do about "books"...I judged it by it's cover. Or better yet, the size of it's cover. I thought "this is one big book, I don't know if Donovan (age 5 1/2) is going to sit through this story in one sitting". When I opened the book, I noticed the large writing and thought it was perfect for little eyes to read along with. I was truly amazed by the phenomenal artwork which was inspired by Jackie Robinson's actual photographs. Donovan and I sat and had fun reading the book...he loved it! It wasn't nearly as long as I'd thought and as a parent I can appreciate the fact that the book is not only a lesson in bravery, but also a wonderful lesson in history. Don't just take my word for it, check it out for yourself! Here's your chance to win a copy of the book!! Post a comment here between now and 11:59 PM EDT on October 21st to be entered into a random drawing. Four (4) additional winners will receive a copy of the book! Tweet this giveaway and post here in a separate comment for an additional entry into the random drawing!! Good luck and enjoy the book...we certainly did! 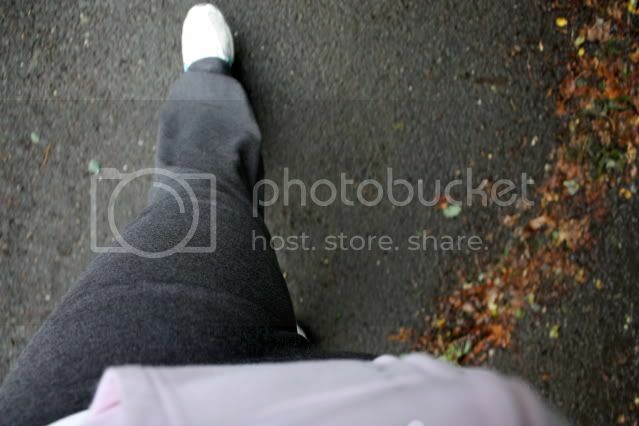 Yesterday...I walked for the cure for the first time! My walk was dedicated to the honor of Katherine, a grandmother figure to me who had a mastectomy as a result of breast cancer and to the memory of Barbara, my aunt in law who lost her battle with breast cancer 5 years ago...I still miss her so much. The thought of breast cancer has had such an impact on my life since I was 17 years old and found a lump in my breast. I had to have a lumpectomy but was lucky, the lump was benign. Ever since then I have tried to be proactive in reminding the women closest to me about the importance of checking their breasts. Early detection is key to beating this disease! 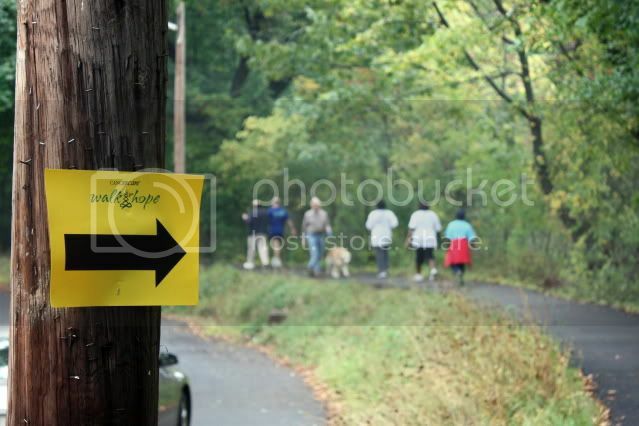 Walking for hope at Nomahegan Park in Cranford, NJ. I am so excited to announce that Shimmerz Paints is showing support for breast cancer awareness!! "It's October! That means it's National Breast Cancer Awareness Month. We wanted to show our support by showing our Pink!! For the whole month of October, we will be sharing Pink projects created by our Shimmerz Girlz! BUT, we want you to get involved also. We want you to create projects using ANY Pink Shimmerz that you have! Any shade of pink. Then, upload it to the Shimmerz Flickr Group! Each Design Team Member will choose their favorite project, and each winner will receive something Pink! We are excited to see what you come up with! Stop by all month to see what the Design Team creates using Pink! Let's not just create, but inspire and spread the word. Post it on your blog, and let others know! Let your light Shimmer!" If you would like to make a donation to the Susan G. Komen Foundation to further breast cancer awareness and research, click here. Thanks so much for your attention...remember...check yourself! Today is World Card Making day and here is my contribution! The other day I create a layout using Webster's Pages (I can't show you that until later this month). Their papers are so phenomenally beautiful...I was more than happy to make a card with the leftovers. 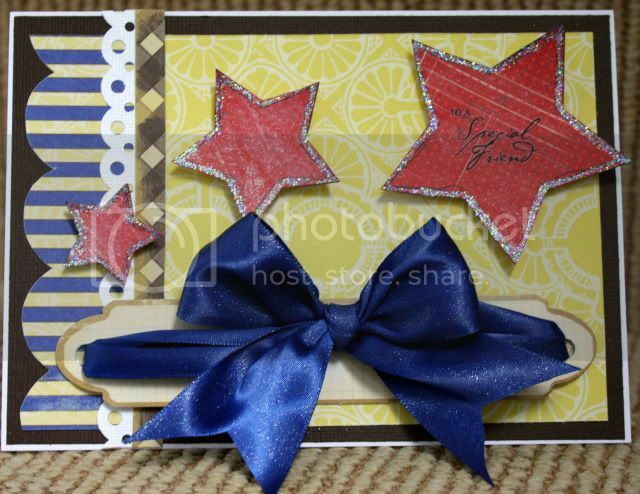 I used Shimmerz barn door spritz on the stars and sapphire spritz on the satin ribbon for a beautiful finishing touch! 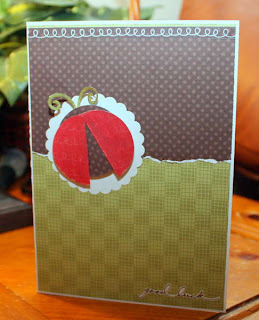 Card making day is not just for cards...I threw a layout in the mix, too! 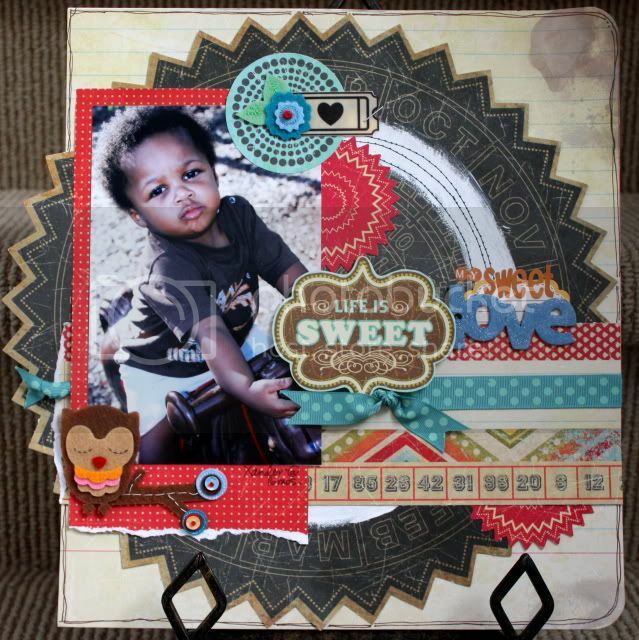 I love these papers by Collage Press, they are the perfect match for this photo, one of my fave pics that I took this summer. It's of my little Xan and I love it because it's so full of personality and I just want to kiss all over those sweet cheeks every time I see it! I also used Shimmerz spritz here too. I spritzed truffle in the upper and lower right corners. I trimmed the background paper to 10 3/4 x 12 to accommodate for the overhang. 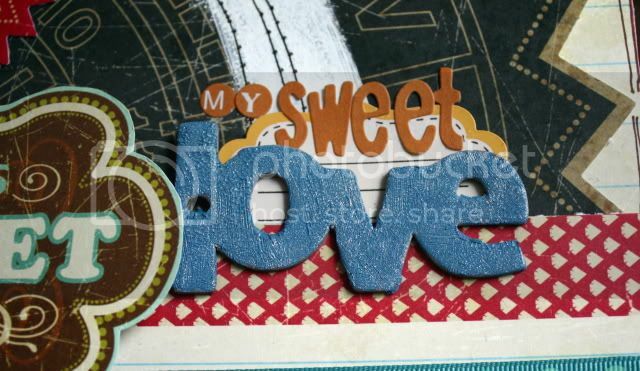 Then I spritzed truffle over the chipboard word that I painted with crackle paint. The crackle and the glimmer seems like a contradiction in terms, but works so well here. 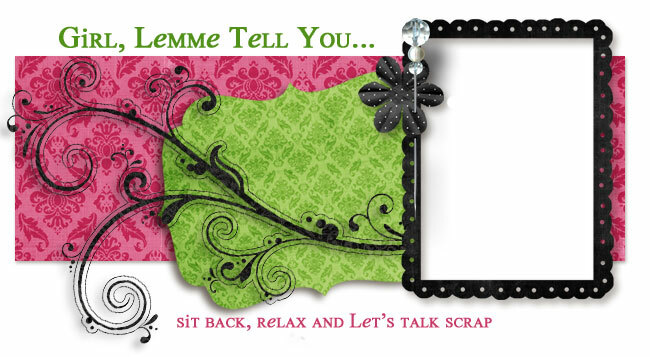 Thanks for taking a peek...have a great time creating today!! !